Bluerack a modern,clean,unique,professional and fully responsive Web Hosting Template.It looks perfect on all major browsers, tablets and smartphones.You can add unlimited layouts or edit whatever you want. 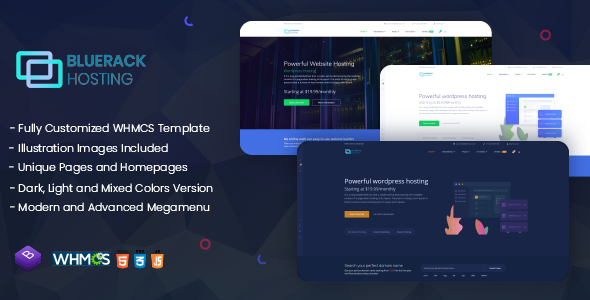 It’s all up to you.It is fully customized and compatible with the latest WHMCS version, which means that our WHMCS Template is 100% the same with the HTML version, you can also import all html layouts, you can import pricing tables or anything that you like from HTML version. Bluerack is fully responsive and 100% compatible to all large, medium, small or extra small devices. You are free to add or edit everything, it won’t break anything.